Located in the highly sought after Tomahawk Terrace community, this newly renovated two bedroom, one bathroom condo will become your home away from home in Tallahassee. 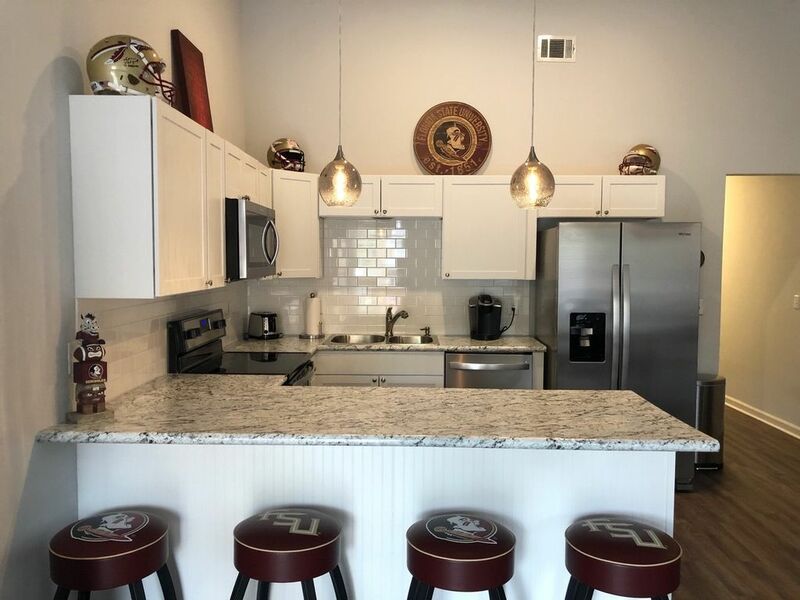 With our convenient location steps away from Doak Campbell Stadium, 1 mile from Tennessee Street and College Town and 2 miles from the Florida State Capitol, you will be in the heart of everything that FSU and Tallahassee has to offer. Whether you are in town for the big game or work, our condo has everything you need for a short or long term stay! We are serious Florida State Seminole fans and have always wanted a place we could use to come and visit for games and hopefully if our kids decide to go to school here (finger's crossed)! We just renovated this unit and it is AWESOME! We love to come and visit with our family and friends and hope you will enjoy it as much as we do! Located near the heart of Florida State University's campus and the State Capitol. Overlooking Doak Campbell Stadium and walking distance to FSU campus and College Town. Four seat counter height table plus four seats at the kitchen counter. We stayed for two nights as a stopover on our way to Gatlinburg. The condo was a clean, relaxing, minimalist design that had everything we needed for a comfortable stay. The furniture was high quality and very comfortable. The location was great - we were able to walk across the street to tour FSU and even over to the capitol. The owner was very responsive, helpful, and friendly when we communicated via messaging. We will definitely seek out this accommodation on any future trips. There was a lot to do in the area and we had a great weekend. Condo was beautiful. Newly remodeled, very clean, beds were so comfortable! Stacy answered quickly if I had any questions. Great location for FSU!